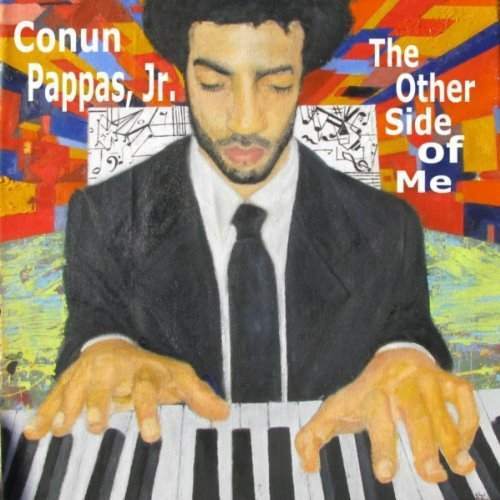 Pianist Conun Pappas, Jr.’s second album, The Other Side of Me, is filled with loneliness, despair, isolation, and Auto-Tune—lots of Auto-Tune—and just about every other lo-fi, processed effect imaginable. It’s also about as far removed from the elegant jazz found on his 2010 debut, Oh, What a Feeling, as imaginable. Here, over the course of a dozen tunes, Pappas spills his broken (Auto-Tuned) heart across layers of detached atmospherics and soulless (modern) R&B clichés. In many ways, Pappas’ latest bears similarities to Kanye West’s musical meltdown 808s & Heartbreaks—except that Pappas’ misery wasn’t brought on by the trappings of his own fame. Backed by drummer Joe Dyson and bassist Max Moran (Pappas’ partners in the Bridge Trio) as well as guitarist Cliff Hines, the music on The Other Side of Me shades the disc’s sonic and emotional palette, giving depth to its despondent underpinnings. Still, despite moving passages, intriguing textures, and incendiary solos, other cuts bog down in their laboriousness. Written, produced, mixed, and mastered by Pappas himself, The Other Side of Me is, if flawed, a fascinating 12-step program. Awesome album with an abundance of creativity, style, and uniqueness that makes Pappas one of a kind.